US President Donald Trump displays the national security presidential memorandum launching the "Women's Global Development and Prosperity" initiative. Martin H. Simon/DPA/PA Images. All rights reserved. Ivanka Trump has had numerous opportunities to do right by women workers in her life, and the record shows she hasn’t taken them. Since her father took office, she has adopted a number of pet projects related to women’s economic empowerment. Her latest effort is more of what we've come to expect from Ivanka: talk of empowerment without paying any attention to what really makes a difference. 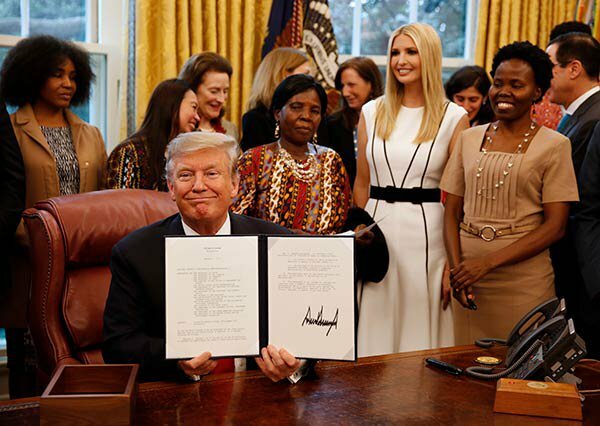 The Women's Entrepreneurship and Economic Empowerment Act of 2018 (WEEE Act), signed into law by President Donald Trump in early January, claims to “address gender-related barriers to economic growth and support women-led businesses” by mandating that the U.S. Agency for International Development (USAID) take certain steps to be more gender-sensitive in grant making and reporting. The most significant piece requires USAID to dedicate at least 50% of its small- and medium-sized enterprise resources to target businesses owned by women. Despite its lofty title, this law has a limited scope and weak language. It pays lip service to gender-based violence, access to fundamental labour rights, and women’s access to property rights, but fails to establish measures to substantively address these important issues facing women workers. Jobs and economic empowerment opportunities are only useful insofar as they are good jobs – jobs that pay a living wage and allow workers to form unions, without fear of retaliation. There is no guarantee that because a business is woman-owned, that business will provide good jobs. And if an initiative is not pro-worker, it can’t claim to be pro-women. From the first announcement of this legislation, there was reason to be heavily skeptical. As documented by the Washington Post in 2017, Ivanka Trump’s eponymous clothing brand was rife with reported labour abuses. The primarily women workers sewing clothes for the Ivanka Trump brand made some of the lowest wages in the world. Her company failed to take basic steps to improve its practices, like disclosing the list of its supplier factories or signing the Accord on Fire and Building Safety in Bangladesh. The brand, which is now closed, was hardly a positive sign of Ivanka Trump’s commitment to working women. Ivanka has also failed to take action to support a new international convention on gender-based violence in the workplace. Unlike the WEEE Act, this critical initiative would establish a global human rights standard around sexual harassment and violence at work, driving legal reform around the world. Unequal power relations in society and at work result in women, as well as trans and gender non-conforming people, facing increased exposure to violence and harassment at work. Yet no specific international standard exists on this issue. Governments around the globe have been involved in negotiating a ground-breaking new benchmark, yet the United States has been conspicuously unresponsive to solicitations for comment from the International Labour Organization. Perhaps the most glaring omission from the WEEE Act is the millions of women whose economic opportunity isn’t of interest to the president’s daughter. The women from Central America seeking asylum at the US-Mexico border, for example. Is Ivanka Trump invested in their economic empowerment? Is she concerned about their access to decent jobs, affordable credit and financial institutions? Not likely, since no one in the Trump family has spoken out against the humanitarian crisis at the border. The United States played a key role in creating the economic conditions that led to many asylum seekers deciding to migrate in search of good jobs. Why not take action there? As with her previous efforts in this arena, Ivanka seems to focus exclusively on women entrepreneurs and business leaders. This excludes most working women. It’s true that none of the mandates outlined in the law are necessarily harmful. All government agencies could benefit from taking a more gender-sensitive approach to their programs. But such a weak effort exists as talking point for Ivanka Trump, a feather in her cap. She wants to be perceived as pro-women, without actually challenging the power structures that afford her infinite privilege and access, and without challenging the root causes that keep the majority of women in the world in poverty. She wants to empower, but doesn’t want to give up her power to do so. This latest effort is a step in the right direction. But it is a step too small to register with the people who need it most. In an era of fake news, an extra dose of skepticism serves you well. It’s time to apply that principle to the world of ‘women’s empowerment’ initiatives. We need to start asking: who is driving this change? Is this an evidence-based, bottom-up initiative to address the root causes of inequality, or is this a smokescreen to distract from the real causes of inequality? The one thing you can count on is that just because something says it is empowering doesn’t mean it is.